You'll be £20.00 closer to your next £10.00 credit when you purchase ShipCraft Special: Allied Torpedo Boats. What's this? This book, or manual, is very useful and interesting - almost essential - for the modeller. This book is many things, a brief but detailed history of the MTB's, a technical manual with detailed drawings and diagrams, a model guide to who sells what and where, an accessories guide and an inspirational/enjoyable book with excellent representations of a wide variety of MTB's by various modelers in a variety of scales. It contains information on the most important type of MTB's colour reference guides, short critical reviews and reference sources. It is excellently written and presented with good quality photographs and drawings, although on the drawings you need a magnifying glass to read the associated data, but that is understandable given the drawings are replications of the actual plans and were not originally intended for A4. The book has already become a well thumbed publication, sparked several ideas and provided a wealth of information in a nice user format. If you have an interest in MTB's then this is a real plus for the modeling community. Regardless of what scale you build in there is information in this book that will help. Alternatively, if you are just thinking about building one of these small ships then the reviews and accessories section will be of great use. Throughout this 126 page information packed book, there's everything from the highly detailed line drawings, original photographs, and scale models from 1-1200 up to 1-1000 all making one wonderful book. There are more than likely quite a few books like this out there, and this is a first for me, when building say a 1-72 PT boat, following the instructions is okay, but only up to a point, sooner or later you'll need actual photos, colours and so on. This book also offers the market extra, things to look out for, what you can buy in aftermarket upgrades. Gunthwaite Miniatures have to be seen to be believed, as well as accessories from White Ensign Models... there is as expected, a wealth of information dealing with a very nice swap between the real world of the torpedo boats, and that of the model world. 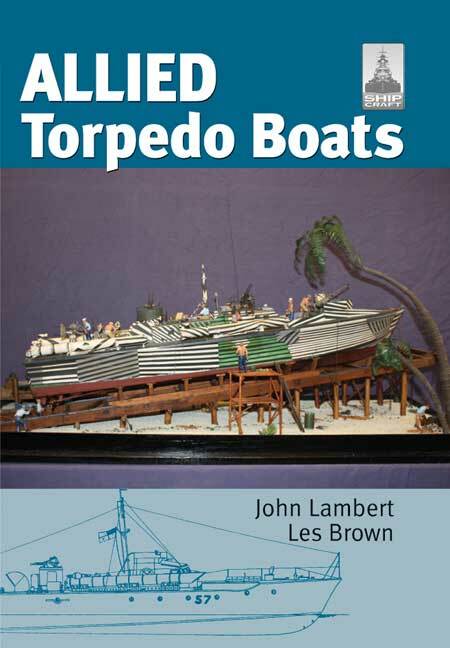 I believe that John Lambert and Les Brown, have managed to piece together not only a slice of history but detailing the model building hobby as well, all within one book. I count myself very lucky as 2 of my models appear within this book. And this is also my first review and being apprehensive and slightly stepping into the unknown, I find it hard to describe a mixing pot of information... I do know one thing, I wish I had this book when I was building my original PT 100! The content is packed with information that makes you want to turn a page, from the history of torpedo boats from 1915-1945, which then goes on to model products, showcase, construction, after market products for scales 1-1200 to 1-100. This book offers the reader a great reference with a ton of original photographs... my first thought on seeing these, dioramas, using the back-drop of building your own impression. Not only a reference to torpedo boats, but a wonderful guide to building and getting the best out of a model... not just grey on green, but camo patterns as well, defused paint work that you'll pick from original photo's or very masterfully built scale models. The front cover is like the icing on the cake, and as you turn the pages this just gets better and better. I, not being 100% sure if this book was designed for history or model building or both, it certainly comes across as an incredible work of art, and those original photo's are worth buying this book just for those. Factor in the producers of after market products for the scale model, and you have a complete book, that perhaps could have been in two parts. There is a lot to take in, and John Lambert and Les Brown have done wonders, and I believe this book is worth every penny. In conclusion - I feel this is a great addition to building any of the allied torpedo boats with a big plus for diorama ideas! Overall it is an interesting read about a subject that I have seen little modelled myself. Naval modellers that are looking for image references on Allied Torpedo Boats will find this a very helpful book with over 300 B/W and colour photographs. Some of the line drawings are a bit small but the author has provided a web address where most of the plans are available in large scale. There is also two pages of selected references at the back of the book for the reader to further their research of this particular subject.